Uglyworld #1097 - There Is A Perfectlies Good Explanationer (Project BIG - Image 133-365), originally uploaded by www.bazpics.com. Today the reason for Babo's apparent madness was revealed, and thankfully it wasn't even the least bit sinister after all, I better let Babo explain. "Hi everyones, is Babo heres again. I is sorries if I makered somes of you feelers nervousings but I couldn't shares what I had with Baz untils we was safelies back home"
"I lovers to plays with the gamering machiner you guys likes to calls the Ex-Boxer, and lasts year I takered parts in a competitions to wins some awesomer Halo goodies, and what arrivered on Wednesdays was my mega awesomer prize!" 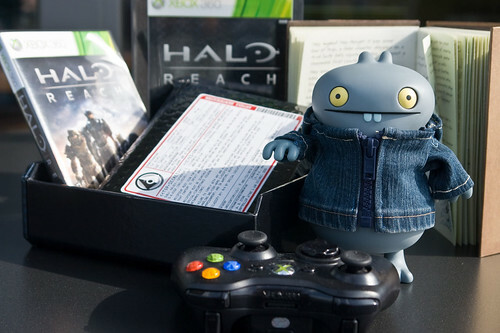 "Checkers it outs, I not onlies won the cools Halo Reach gamer, but it was also parts of the awesomes limited editioner box set which containeds top secrets photomagraphy, sliders, as well as a diary fulls to the brim with informationisms abouts the Covenant, and lifes on Planet Reach befores everything went mentals there." "Hads I shareded the facts that I winnered the prize while we was aways with works, then it woulds have been hards for me to gets to players it firsts, so I hads to be secretivers abouts it all, hopes you understands!"